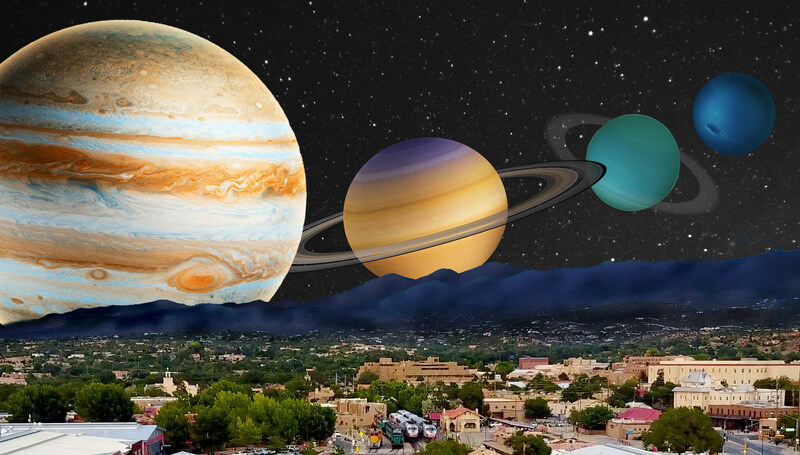 June 7-8, 2018, the first annual InterPlanetary Festival will render Santa Fe's Railyard district a platform for imagining future human civilizations, on and beyond Earth. Speakers at the festival will include luminaries such as Seamus Blackley, a designer of Microsoft's Xbox; Cory Doctorow, editor of Boing Boing; Ashton Eaton, Olympic gold medalist and aspiring Mars colonist; Annalee Newitz, tech culture editor at Ars Technica; Jonathan Nolan, creator of Westworld; Martine Rothblatt, founder of Sirius Satellite Radio and of biotech company United Therapeutics; Neal Stephenson, author and futurist; and Pete Worden who chairs the Breakthrough Prize Foundation. They will join complexity scientists and space enthusiasts for two days of thought-provoking discussions on the complex life support systems essential to sustaining interplanetary civilization. In addition to free and accessible science talks and panels, the festival will feature outdoor musical performances by artist JiHAE, Santa Fe funk band The Sticky, theremin virtuoso Rob Schwimmer, musician and podcaster Michael Garfield, and Los Angeles-based multi-genre group Ozomatli. Theaters and arts businesses in the Railyard district will host space-themed events during the festival. The Jean Cocteau Cinema will screen movies like "Forbidden Planet" and "Terminator 2: Judgment Day;" SITE Santa Fe will be showing select episodes from Carl Sagan's original "Cosmos" series; and the Violet Crown, will offer space-themed beers to accompany a screening of "The Fifth Element," to be introduced by Scott Ross, who created the film's visual effects. The InterPlanetary Festival is part of the Santa Fe Institute's ongoing InterPlanetary Project, which aims to bring complexity science to everyone, everywhere, in an exciting, engaging, and experiential way. Those unable to attend in person will be able to watch livestreamed talks and discussions from the Santa Fe Institute's youtube channel.